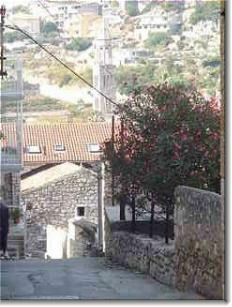 There's nothing like staying in fabulous Hvar Town but there are benefits to staying out of town (see rural Hvar accommodation). For example, you'll enjoy the peace and quiet of a more rural holiday. See below for more tips on private accommodation in Hvar. Most owners will meet you at the ferry in Stari Grad at a small additional charge and offer free pick-ups at the port or bus station. It's good to take advantage of this service as houses in Hvar town can be extremely difficult to find. When you arrive, get the owner's business card so you can call them if you get lost. There are no street names (let alone numbers) and it's easy to get confused. Think carefully about the location. Streets rise steeply from the Hvar town harbour; much housing is at the top of a hill where you must go down several flights of stairs to reach the harbour. Travellers of limited mobility, beware! Consider a stay in Jelsa or Stari Grad. These towns are somewhat cheaper than Hvar Town. See more advice on private accommodation in Croatia.